It's been a quite a while since I've played on a MyM server but reading the other reviews I was shocked. I saw tons of bad reviews claiming that the staff were rude, etc; I strongly disagree. I used to play on the B-team server and at the time it was the best server I had ever played on. The staff would always help me when I needed help and the community was also very nice. I honestly miss those days and wish I could go back. Mine Your Mind will always hold a place in my heart because of the fun it brought me! One of THE laggiest servers I had ever been on. Constant mini-stalls every 10 seconds, and nearly no staff to speak of. When my house was griefed with a claim bypass I couldn't get any help at all. Moved on to a better network and never looked back. Doing this review because somehow I forgot to do it before. Quite Laggy and when looking on the Website couldn't find any banned item lists. Silly things are banned and blamed for LAG. I only found this out from a forum post by an individual, not on the /banneditems list. very spammy chat (vote, register, lag caused by which ME system like it's an award). Worst server i've ever played on , very laggy and there are servers up with less than 5 players , and those servers are laggy as well , do not join i warn you , all these good reviews are fake. The server and community are very friendly, and the staff are wonderful! Hey, I did a vote for your B-Team server, and I did the double vote by sharing on G+ but didn't get double rewards. The staff are absolutely laughable, at least from my experience on FTB beyond. Where I laughed at by a moderator for being gay; after I admitted so and said I did not mind someone using the word in vein. Then proceeded to get targeted there onwards for trivial things such as thicc and autism; with no context that is harmful to any one of any age. There is a lot of lag, no one is doing anything about it and the staff are horrible. TPS lag all the time. This server should not be at the top of the list that's for sure. I give this server a semi good rating due to issues I think need improvement. First I would like to say the server is ran very well in terms of performance which is why I believe the network runs successfully. 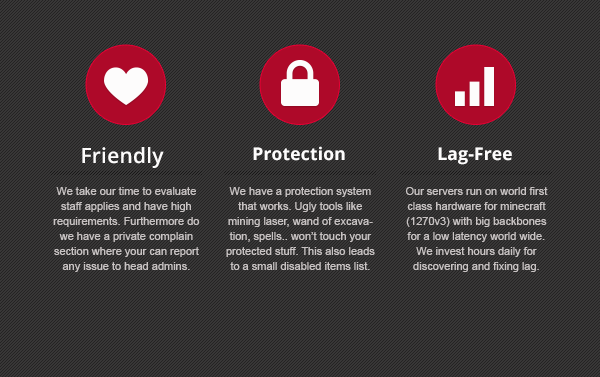 The owners also spend a lot of time squashing bugs and improving the community and knowledge base. Overall the staff are helpful and mature at most times. Tickets are resolved in a quick manner for important matters. Zero Tolerance of any type of theft or griefing on any of the servers. Large array of servers and Mods, and always up to date with brand new mod packs. Ranks that can be purchased work for all servers and mods globally. If you lose items you paid for due to server issues you can expect not to receive them back in most cases, there is a lot of gray area in their terms and conditions with their server. When you do try to request any assistance expect major resistance for resolve. They will repeatedly tell you their return policy till blue in their face leaving no room for negotiation regardless of the situation. The servers obsession with end game items on the market is out of control, they hold a very strict grip on the market and what can be put on it. If you get caught selling items that are considered end game (The list if full of stupidity in my opinion) they will possibly ban you for a period of time after inital warning. Mid game MYM's will have less value to a player because of this. Don't ever suggest that an item is not end game or you'll have the complete staff team jumping on you like linebackers. The server has 4 types of currency Tickets, Tokens, Credits and MYM's. All which are a mind cluster to get use to when your a new player. System should have Credits and MYM's and do away with the Tickets and tokens to save confusion. Support Ticket system is another mind cluster that needs to be more simplified as a lot of people can't figure it out without spending 20-30 mins trying to link their accounts and other obstacles to create a ticket as a new player. Further more I believe the server just overall complicates things that really don't need to be complicated such as the things previously mentioned. What seems easy to one person may not seem easy for another sadly they really don't take this into consideration with some of the choices they make. Overall don't make suggestions, it's a waste of time, they want what they want regardless of what you suggest. I would just like to let you know that both the refund policy and the endgame item trading rule, have been discussed in length and decided by the community to be kept in place. Since this time we strictly stick with it. While I understand that it comes across harsh when requests for item refunds are denied in a quick fashion and end game items removed from the market. But it is also important to keep in mind what would happen if this wouldn't be the case, if we would discuss every situation in length. The confusion this would cause and the missing clarity.. Just something to keep in mind. Overall you make a good point, MyM has always been known to be very strict, expecting players to really play alongside the rules, have a mature appearance and to show own initiative. Some might like it while others can't bear it. This is really something to keep in mind when looking a for server to spend a lot of time on. Regarding suggestions, it is true, most of them are quickly decided against after consideration. The main issue is that we are running a big amount of servers and have done so for years. Like with every company and human being, when you get old and found a good way of dealing with things, change is slow. A cruise can't turn at the rate of jet-ski, nor can the engine be swapped in a timely fashion and if it is, there are 50 engineers that need to be trained instead of 1 (the jet-ski owner) and failures affect thousands of people on the ship. Complexity and size are the death of change, especially if the current system is solid and working. This server is great for people of all ages, it has many servers ranging from infinity to direwolf20 and I guess the best part about it is the community! This is by far the best network i've ever been on, the mod packs are amazing, and they arent afraid to try experimental packs. Then the admins spend literally DAYS working to make sure any problems with them are resolved. I've never seen a staff so committed to making the player experience as great as possible. I've got 2+ years on the network and not a moment regretted. 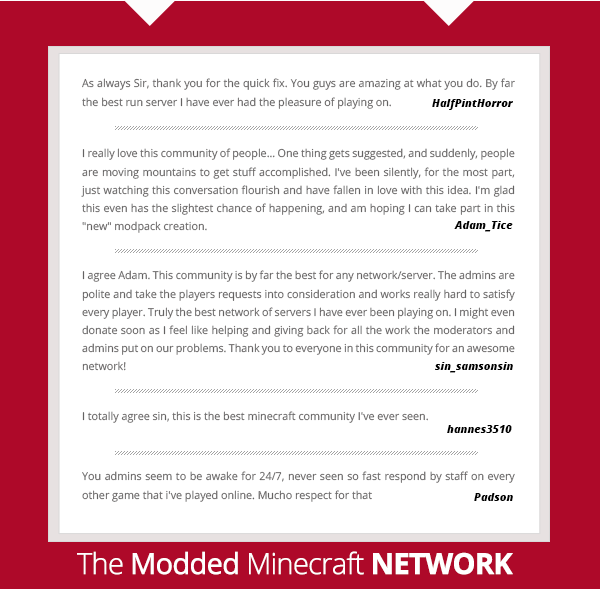 Honestly a great server, I have never seen staff that put in so much work and developers/admins that sometimes even make their own modpacks that are truely amazing. There is so many ways to get help, they have a teamspeak server and everything. And if the servers do go down, it is due to a mod issue plus the owner correctly handles supply and demand. The community is so amazing, with everyone being friendly and easy to talk to. I have met one of my good friends on this network, and many more are easy to find. The people on this network are very kind and hard working staff make playing on this network amazing. 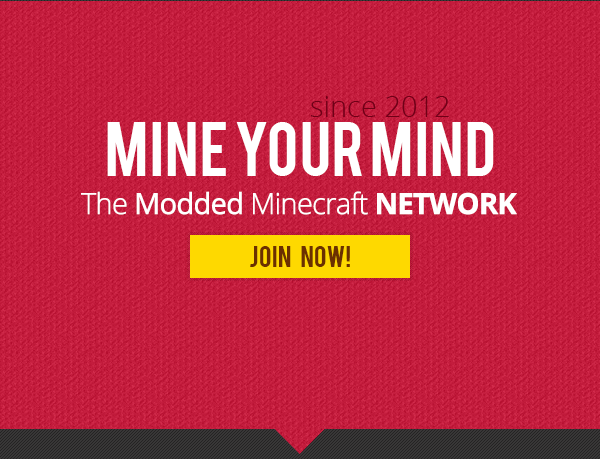 I would really recommend this network to anyone who loves modded minecraft. It is also very easy to get quick support on this network by using the forums, ticket system, public support slack chat and Teamspeak to get support. If I had 100 hands, 100 thumbs up. Laggy servers, rude staff, aweful servers in general. Would not recommend. Unfortunately we did not receive any input/reports from you. We provide many ways to get in contact with staff and report performance problems. Often those issues are based on the network connection, if they don't show up on our monitoring, which is all green to +90% of the time (P30 - P600) https://mineyourmind.net/server-status.html. We are very picky regarding staff members and strive for a friendly communication with the player. Staff needs to go through multiple levels of application, tests and training. Therefor a rude behavior from staff does not happen often (we get about one report that checks out every 2-3 months and have +4000 active players (+5 hours playtime) every month). If you encountered any "rude" behavior please report that immediately so we can address the matter. I've played on this server network for over a year, and it is by far one of the best groups around. I've never experienced any significant down time, the community is helpful, and the staff is responsive.